The dispensing result is mostly determined by the correctly centred position of the tip of the needle. To compensate for the tolerances, deviations have to be measured after every needle change. The XYZ dispensing needle adjustment involves a fully automatic sensor for aligning the dispensing needle position along all three coordinate axes. 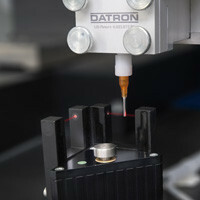 Via a mechanical probe and two forked light barriers, deviations from the actual dispensing axis are determined in the length, as well as in the bend of the dispensing needle, and are compensated automatically by DATRON software. The sensor is programmed with a dispensing macro. A corresponding example macro is included in the delivery.